Titanium Nitride coating reduces friction and last longer, cutting edge stays sharper longer. Used in repetitive metal drilling with portable drills or stationary drill press. Jobber length. Titanium Nitride coating reduces friction and last longer, cutting edge stays sharper longer. Used in repetitive metal drilling with portable drills or stationary drill press. Jobber length. Titanium Nitride coating reduces friction and last longer, cutting edge stays sharper longer. Used in repetitive metal drilling with portable drills or stationary drill press. Jobber length. Titanium Nitride coating reduces friction and last longer, cutting edge stays sharper longer. Used in repetitive metal drilling with portable drills or stationary drill press. Jobber length. Bosch Jobber Drill Bit, 1/16 in Diameter, 1-7/8 in Overall Length, 2 Flutes, Twist Flute, 1/16 in Shank, Straight Shank, 118 deg Point, Split Point, Titanium Coated, Applicable Materials: Sheet Metal Ducts, Steel, Copper, Brass, Aluminum, Plastic, Plexiglas, Wood, Veneers, Vinyl Siding, Plasterboard, PVC, Stainless Steel and Cast Iron Titanium Nitride coating reduces friction and last longer, cutting edge stays sharper longer. Used in repetitive metal drilling with portable drills or stationary drill press. Jobber length. M7 grade steel with extra hard titanium coating and parabolic bit flutes for strength and maximum service in applications such as metal, wood and plastic; split point prevents walking. M7 grade steel with extra hard titanium coating and parabolic bit flutes for strength and maximum service in applications such as metal, wood and plastic; split point prevents walking. M7 grade steel with extra hard titanium coating and parabolic bit flutes for strength and maximum service in applications such as metal, wood and plastic; split point prevents walking. M7 grade steel with extra hard titanium coating and parabolic bit flutes for strength and maximum service in applications such as metal, wood and plastic; split point prevents walking. Titanium Nitride coating reduces friction and last longer, cutting edge stays sharper longer. Used in repetitive metal drilling with portable drills or stationary drill press. Jobber length. Titanium Nitride coating reduces friction and last longer, cutting edge stays sharper longer. Used in repetitive metal drilling with portable drills or stationary drill press. Jobber length. 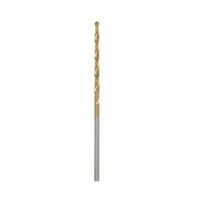 Bosch Jobber Drill Bit, 7/64 in Diameter, 2-5/8 in Overall Length, 2 Flutes, Twist Flute, 7/64 in Shank, Straight Shank, 118 deg Point, Split Point, Titanium Coated, Applicable Materials: Sheet Metal Ducts, Steel, Copper, Brass, Aluminum, Plastic, Plexiglas, Wood, Veneers, Vinyl Siding, Plasterboard, PVC, Stainless Steel and Cast Iron Bosch Jobber Drill Bit, 1/8 in Diameter, 2-3/4 in Overall Length, 2 Flutes, Twist Flute, 1/8 in Shank, Straight Shank, 135 deg Point, Split Point, Titanium Coated, Applicable Materials: Sheet Metal Ducts, Steel, Copper, Brass, Aluminum, Plastic, Plexiglas, Wood, Veneers, Vinyl Siding, Plasterboard, PVC, Stainless Steel and Cast Iron Titanium Nitride coating reduces friction and last longer, cutting edge stays sharper longer. Used in repetitive metal drilling with portable drills or stationary drill press. Jobber length.